DuraLife™ Siesta Hardwoods Blends Collection’s ColorLock™ Multi-Layered Finishing System helps resist fading over time, unlike ordinary composite decking products. Ordinary decking products can stain with every spill, but DuraLife™ Siesta™ Collection is highly resistant to stains, so clean up is quick and easy with just soap and water. The technology and appearance of composite materials has advanced over the last decade. Fiberon “invented” the current state of the art in composite decking. Fiberon products represent the “best in class” for your composite deck. Iron Woods® is the original, leading brand of naturally durable wood products. Favored by design professionals and consumers alike, the Iron Woods® brand has become synonymous with commitment to superior quality and environmental accountability. Our product's strength, hardness and durability have been proven again and again in demanding commercial applications like the famous Atlantic City and Coney Island Boardwalks and in backyards across America. Ipe decking, Cambara decking, and Garapa decking are in stock and ready for your next project. SpaceMaker Outdoor Flooring is a new standard in composite decking. The patented interlocking and water sealing design not only hides screws for aesthetic appearance, but provides a dry space underneath for extra living or storage without the extra step of a ceiling assembly. SpaceMaker truly combines innovation, practicality, and above all aesthetics to create a versatile twist on outdoor living. A Revolutionary Design for Elevated Decks with Patented Super-Seal Technology Spacemaker’s patented interlocking and water sealing design provides dry space below and fastens easily to joists with hidden composite deck screws. Resysta® has the warmth and feel of wood, yet it possesses the sustainability and wearability natural wood lacks. Resysta® is an excellent material choice in a number of construction applications. Not only does it offer the look and feel of wood, it has many similar working properties of wood. It can be bent, shaped, and joined similar to wood. Resysta® can also be stained in a wide palette of natural wood tones and designer colors for even more design versatility. Resysta® is water and UV resistant, making it perfect for any exterior application, even in locations subject to driving rain, snow, frost and constant sun exposure. Western Red Cedar railing systems and accessories utilize premium clear kiln dried Western Red Cedar and are produced in a wide range of styles and profiles to fit virtually any design or décor. 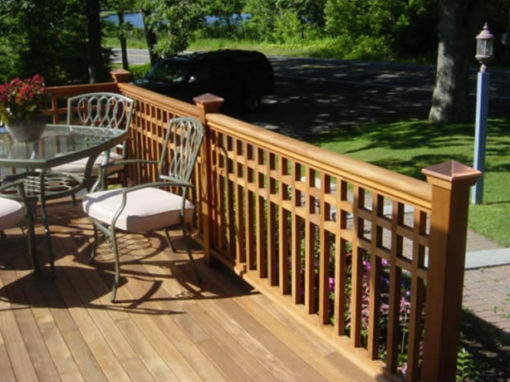 Cedar rails and posts are also combined with glass or powder-coated aluminum balusters to offer a low maintenance railing with the warmth and beauty of cedar. The sealer of choice for over 30 years, ANCHORSEAL® creates a wax barrier that protects against end checking and costly degrade in freshly sawn logs and lumber. Known in the forest products industry as the best quality and most stable wax emulsion end sealer available. 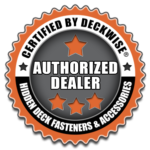 The Made in the USA DeckWise® flagship decking product, Ipe Clip®Hidden Deck Fastener, consists of an injected mold hidden deck edge-mount clipcontaining a black oxide steel insert. Ipe Oil™ Hardwood Deck Finish is an oil-based natural wood finish. It is specifically formulated to protect and preserve the natural beauty of exterior hardwood decks. 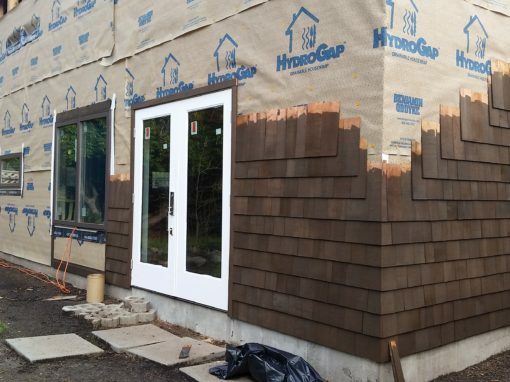 We offer several lines of Penofin of high quality penetrating oil finishes for exterior wood surfaces including Blue Label Penofin, Ultra Premium Penofin®, and Penofin® Hardwood Formula.